Stefanik held on for third with Chuck Hossfeld, Ewanitsko and Eddie Flemke rounding out the top five. 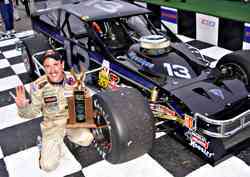 The victory was the third in a row on the Modified Tour for Christopher and his seventh of the season. It came despite the fact that Christopher had a car that wasn’t quite perfect in the handling department. The fact is that it wasn’t. This proved true again this past weekend as the NASCAR Whelen Modified Tour pulled into NHIS and Ted Christopher pulled out as the winner for the fourth time in a row. Early in the race, Christopher had to battle with Mike Stefanik and Doug Coby. All three drivers led laps before most of the lead lap runners pitted just before halfway in the race. As the leaders pitted, Mike Ewanitsko did not. 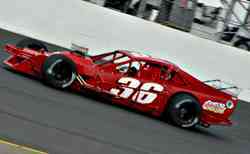 The Long Island driver was making his return to a racecar after eye surgery later this summer. It had been a few years since he had raced, but the driver who is ranked fifth in career wins on the Modified Tour had not missed a step. He started in the back when qualifying was rained out and made steady progress upwards. He decided not to pit and took over the lead on lap 46. On September 12, 2003; John Blewett, III beat Ted Christopher in a NASCAR Modified race at New Hampshire International Speedway. There have been four Mod races at the track between then and now, but nobody has beaten Christopher at the Magic Mile since. Each time, a different cast of characters tries and sometimes they come close. Chuck Hossfeld might have been able to do it this July if not for a NASCAR penalty for jumping a restart. Maybe Mike Christopher could have done it last year if he raced his brother a little more aggressively in the draft. Todd Szegedy might have won a race last year at NHIS, but was planted into the outside wall instead. Doug Coby, Mike Stefanik or Mike Ewanitsko all led laps this past weekend and could have won if things had gone a little bit differently. But when all was said and done, it didn’t matter what could have been, might have been or would have been. "In the end, I was worried because it was really, really loose, but I had a good car, and they made the right adjustments on the pit stop, which they always do for me,” said Christopher. “I've got a great crew. I had to fight for it, and it was a good race, but I knew with the horsepower we had I was gonna pull 'em off." 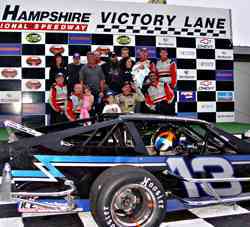 With the victory, Christopher became only the second driver ever to sweep Busch North and Modified races at New Hampshire in the same day. Mike McLaughlin accomplished that fete in 1991 and TC remembers that day well. We’ll have his reaction to following in the footsteps of “Magic Shoes” McLaughlin, and much more, in our leftovers later this week. Christopher's #13 leads the #77 of Coby and the #16 of Stefanik. Ted’s #13 might have been handling poorly, but it had plenty of power and that was key. "We were a little bit better handling, but Teddy had a little bit more under the hood,” said Stefanik. “I tried my best to set it up for a one-lap pass, but that lapped car kind of messed up my timing a little bit. I don't know if I would have been able to. I had to really try to come up with some plan because Teddy was awful strong. We were better in the corners, but that Ford he's got is just incredible. We've got an awesome Chevrolet, it's better than anybody else's out there, but it's still lacking to that Ford. That Ford's a thumper." Was Ewanitsko’s pit strategy a result of threatening skies during the midpoint of the race or a car that was working well enough not to need any adjustments or new tires? It turned out that fresh rubber was the key to victory, as Christopher and Stefanik made it back up through the field to content for the win, but Ewanitsko held on to finish a very strong fourth. And what about Coby? He finished seventh after falling back during the pit stops because of repairs that needed to be made to a broken shifter. Christopher retook the lead on lap 65 and except for the 86th lap, when Stefanik poked his nose through to lead at the line, he rode to the finish out in front. Stefanik was never far behind, but there was not much late-race drama when it came to wondering if TC would continue his win streak either. Mike Ewanitsko (#36) had a good return to racing. The #13 team celebrates their win.